Orlando Shootings Prompt Cities To Consider More Security For Pride Events June is Pride month for the LGBT community, and several larger cities will hold events over the next two weekends. Some would-be participants are debating whether they'll stay home this year. 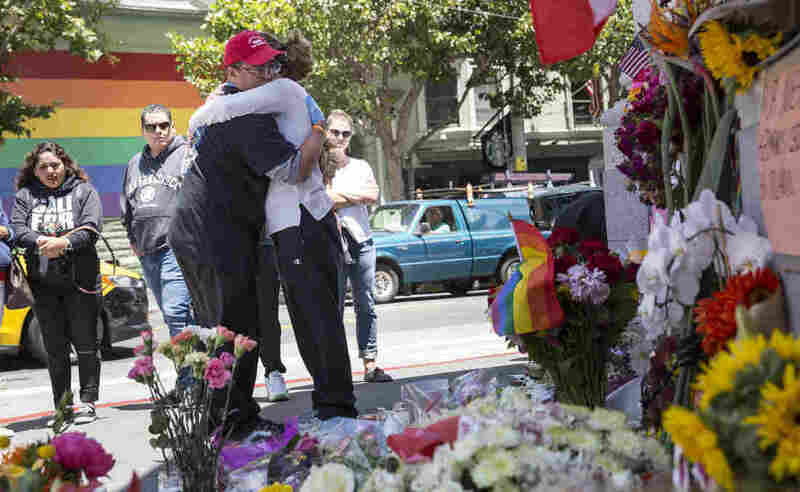 Larry Pascua hugs a friend Monday in San Francisco amid flowers and other items left as a memorial to those killed in the attack on a gay nightclub in Orlando, Fla.
At the corner of 18th and Castro in San Francisco's predominantly gay Castro district, there's an impromptu memorial for the Orlando, Fla., shooting victims: candles, flowers and signs that read "Love Conquers Hate" and "You Only Make Us Stronger." Daniel Kobetitisch, a student, solemnly watches the memorial for several minutes. "I think it's such a horrific event, and unfortunately it scares us all, so," he says. That fear, he says, extends to his plans to attend San Francisco's Pride Parade in two weeks. Kobetitisch says he'll be there, but with some hesitation. "And especially what happened with the reports about the guy who came with explosives to LA Pride, I'm scared and I'm hopeful that the SFPD will be doing their job for San Francisco Pride to make sure we're all safe, having a safe space," he says. San Francisco boasts one of the largest Pride celebrations in the country. As many as a million people are expected. The police aren't commenting on their security plans, but they and federal law enforcement agents plan to be out in force. "And we aren't going to see it. We aren't going to know about it, but they're going to be out there — extra eyes, extra hands, extra ears — to ensure public safety for the LGBT community, supporters, friends and family because a lot of people are going to be there to show solidarity to those who fell in Orlando," says Sam Singer, spokesman for SF Pride. Other cities including Chicago, New York and Houston also promise more police on the street, in uniform or not, for their events. "We want people to come downtown to enjoy the festival," says George Buenik, executive assistant police chief in Houston. "We want people to come downtown to enjoy the parade. We don't want them to be in any type of fear because we're gonna be down there trying to keep everybody safe." It was later revealed that Houston police are investigating a threat against the Pride event posted on a now-deleted Twitter account. In Denver, more than 350,000 people are expected to attend that city's PrideFest this weekend. The event's spokesman, Rex Fuller, says it's been an emotional week. He was in his office first thing Sunday morning when he got a surprise visitor. 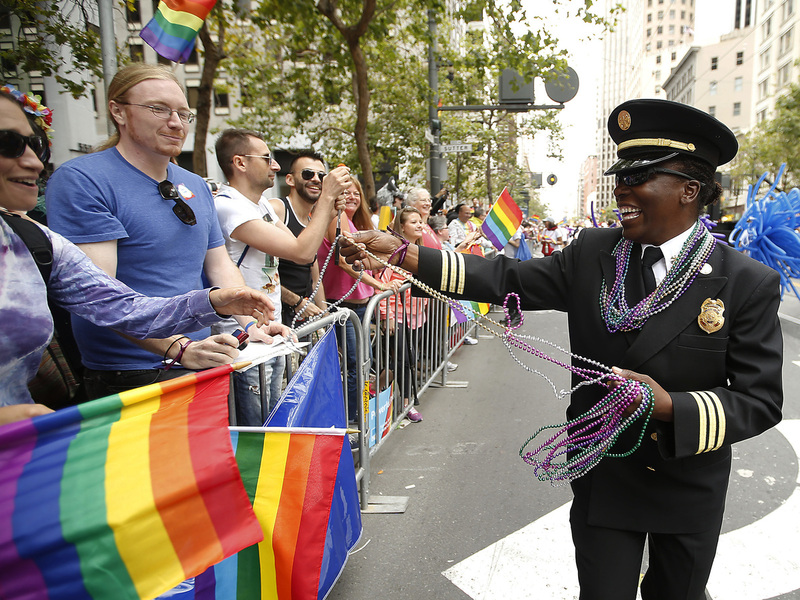 San Francisco Fire Department Deputy Chief Raemona Williams (right) passes out beaded necklaces to the crowd during the 2015 San Francisco Gay Pride Parade. "One of the officers from District 6 showed up and just knocked on the door and said 'Hi, we're just going around to different businesses and gay organizations just to make sure everybody's OK,' " Fuller said. "It's been very comforting to have people say, 'We've got your back.' "
Outside a coffee shop in Oakland, Calif., law student Carla Lopez says she'll attend the SF Pride celebration with reservations. There might be safety in numbers, she says, but after the mass shootings in Sandy Hook, Charleston and Orlando, she's not so sure. "If not a school, if not a church, if not a gay bar, what, what is — what is a safe space? I don't know," Lopez says. She smiles. Lopez says being queer means you always have to think about security.